Israeli bulldozers demolished the unrecognised Bedouin village of Al-Araqeeb in the Negev desert in southern Israel for the 139th time yesterday morning. 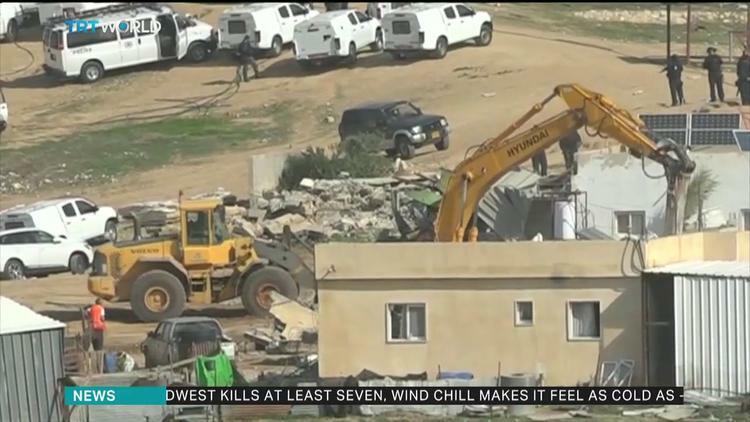 Villagers of Al-Araqeeb reported that Israeli forces and the “Yoav” unit from the Israeli Negev Development Authority stormed the village, escorting bulldozers and vehicles that carried out the demolition. Women, children, and the elderly were evacuated and left without shelter. Three women, alongside head of the village’s popular committee, Ahmad Khalil Abu Mdeighem, were detained by Israeli forces and released a few hours after the demolition was carried out. The Israeli demolitions of Al-Araqeeb are carried out in attempts to force the Bedouin population to relocate to government-zoned townships. Like the 34 other Bedouin villages “unrecognised” by Israel, Al-Araqeeb does not receive any services from the Israeli government and is constantly subjected to the threats of expulsion and home demolition. These “unrecognised” villages were established in the Negev soon after the 1948 Arab-Israeli war following the creation of the state of Israel, when an estimated 750,000 Palestinians were forcibly expelled from their homes and made refugees. Many of the Bedouins were forcibly transferred to the village sites during the 17-year period when Palestinians inside Israel were governed under Israeli military law, which ended shortly before Israel’s military takeover of Gaza and the West Bank, including East Jerusalem, in 1967. Now more than 60 years later, the Bedouin villages have yet to be legally recognised by Israel and their residents live under constant threats of demolition and forcible removal.